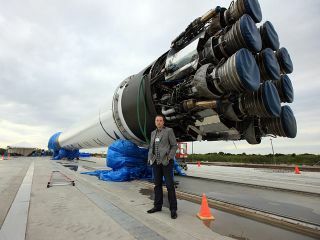 SpaceX's Falcon 9 is being readied for its debut flight in 2010. PayPal co-founder turned rocketeer Elon Musk has backed the venture. Whenthe commercial rockets built by the private spaceflight company SpaceX blastoff, there is one man at the helm ? SpaceX CEO Elon Musk. That'sthe case for this week's first launch of SpaceX's new Dragonspace capsule, which is set to launch from Cape Canaveral Air Force Stationin Florida today (Dec. 8) between 9 a.m. and 12:22 p.m. EST (1400-1722 GMT). ElonMusk, a veteran Internet entrepreneur and millionaire, created SpaceX in2002 using funding from his previous work as the co-founder of the onlinepayment system PayPal. He is Hawthorne, Calif.-based company's chief rocketdesigner (with a physics degree from Wharton) and has steered the company intoa $1.6 billion deal with NASA to provide 12 cargo flights to the InternationalSpace Station using Dragon spacecraft like the one launching this week. SPACE.com:SpaceX is launching its second Falcon 9 rocket since the successful debut testflight in June, but now you're flying a Dragon spacecraft too. What's been yourbiggest challenge for this major test flight? Musk: The Dragonspacecraft, although much smaller, is just as complex as the Falcon 9. ThisCOTS1 demonstration flight is the first attempt by a commercial company torecover a spacecraft from low-Earth orbit. SPACE.com:For some of our readers who may not have been following commercial spaceflightnews, how would you summarize the significance of this task? Musk: This is would represent an important milestone in the history ofspace, heralding the dawn of a new era where private companies can now bringback spacecraft from orbit. Successful recovery of Dragon would also bodevery well for future astronaut transport. Sincea launch escape system is not needed after ascent, in principle Dragon couldvery easily be converted to a lifeboat with more than twice the capacity ofSoyuz (seven in our case vs. three for Soyuz). I also think COTS flights in general represent a key step towards Americahaving a space program that is both sustainable and inspirational. At a timewhen most technology-based products have seen ever-increasing capability andreliability while simultaneously reducing costs, launch vehicles today arelittle changed from those of 40 years ago. Thistrend cannot continue or eventually our activities in space with dwindle awayand die entirely. The COTS program has already shown that aprivate/government partnership can be fast, cost effective and still meet allof NASA's safety requirements. SPACE.com: SpaceX received the first-ever FAA license to re-enter spaceshipsfrom Earth orbit last month was a big milestone. How would you sum up thataccomplishment and what it means for the future of SpaceX? Musk: We appreciate receivingthe license, but of course what really matters is actually doing thissuccessfully and becoming the first commercial company to come back from orbitsafely. Onlyfive countries and the European Space Agency have achieved this level oftechnology. Then there are the other accomplishments ? like testing ourPICA-X heat shield, developed in close partnership with NASA. Thisis the most advanced heat shield ever to fly. It is so powerful that itcan potentially be used hundreds of times for Earth orbit re-entry with onlyminor degradation each time (like an extreme version of a Formula 1 car'scarbon brake pads) and can even withstand the much higher heat of a moon orMars velocity reentry. Wethink Dragon is a viable option for deep space missions in competition with theLockheed Orion and hope NASA will start to consider Dragon for potential flightto asteroids, the moon or even Mars one day. SPACE.com:With the shuttle program coming to a close next year, how vital do you seethese demonstration flights? What impact could they have on the future of theprivate spaceflight industry? Musk: I think there is atendency to treat each mission as make or break when a new company like SpaceXjoins the field, but no one flight is that important. Mostof the successful launch vehicles experience a failure in one of their firstthree flights before going on to be very successful. These are testflights, and so the information that we gain from them is far more importantthan whether or not we meet all of our mission objectives. Wenow have Falcon 9 and Dragon in steady production at approximately oneF9/Dragon every three months. The F9 production rate doubles to one everysix weeks in 2012. A few failures along the way will at most result in aslowdown of a few months. SPACE.com:A lot of our readers often wonder how close we are to having private companies,like SpaceX, embark on routine cargo-delivery runs to the International SpaceStation. How close is that goal, as well as the idea of private trips forastronauts? Musk: SpaceX hopes tocarry cargo to the International Space Station and back around summer nextyear, with regular servicing flights following on roughly three to four monthintervals. Backat our facility in Hawthorne we are already busy working on the next COTSflight. Given that COTS 2/3 requires completing additional development work onproximity operations and berthing, plus final certification by the NASA ISSsafety review board, it is difficult to predict the launch date precisely. SpaceXcould be ready to carry astronauts to the International Space Stationwithin three years of receiving a contract from NASA. ButCongress needs to act in support commercial crew for that to happen. After theSpace Shuttle retires, the United States will be forced to spend $56 million aperson to fly American astronauts to the International Space Station on theRussian Soyuz. SpaceXhas publicly committed to a price of no more than $20 million (2010 dollars)per seat provided that NASA buys for four flights per year of our seven-seatDragon. That would allow 28 astronaut visits to Station per year (same ascurrent Shuttle manifest), which is really the minimum needed to make full useof all the operational labs onboard. You can follow SPACE.com Staff Writer Denise Chow on Twitter @denisechow. VisitSPACE.comfor complete coverage of SpaceX's debut Dragon spacecraft launch.